Small (Doesn't Expand) Dimensions: 3 in high x 3.3 in wide x 5.5 in deep. Capacity: 0.4 L. Weight: 3 oz. Medium (Expandable in Height) Dimensions: 4 in in hgih (6 in when expended) x 3.5 in wide x 6.5 in deep. Capacity: 0.7 - 1.0 L. Weight: 3.8 oz. Large (Expandable in Height) Dimensions: 4.5 in high (6.5 in when expended) x 4.3 in wide x 7.5 in deep. Weight: 4.8 oz. GENUINE BAG ONLY SOLD BY Nanfeng. Others are counterfeit and do not qualify for the 12-MONTHS warranty. 1. The bike bag is suitable for the seat with rail width 55mm. 2. The bike bag takes 135mm from the bike seat to the tire. How can a bike bag make a genuine difference of enjoyable cycling? 1. The double-strand nylon PU outer casing is more tear-resistant than other bike bags. 2. The bold mesh pocket is durable and ideal for storing sharp objects. 3. 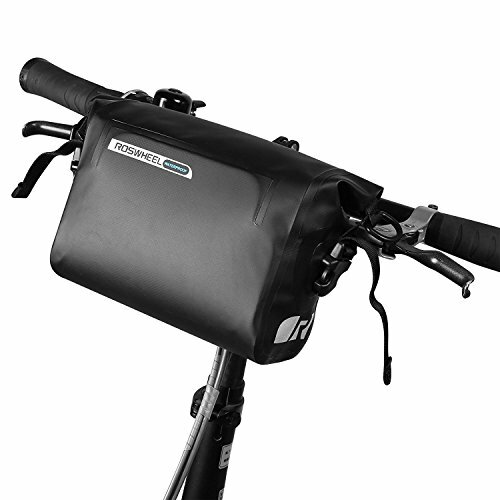 The organ bag design prevents items from falling when the bike bag is fully open. 4. Side opening helps to get items more convenient. 1. It is recommended to apply glue or sealing tape around the screw to prevent it from loosening. 2. The cycling bag can't be installed to monorail or spring-loaded seat. 3. The bike under seat bag can't be installed to seat rail with obstruction. 1. You will get two parts, one rectangular and one buckle. EVA 3D Shell : The Cool Change cycling bag are constructed of tough EVA with 3D die-casting process. The bike saddle bag will look stiff at any time. 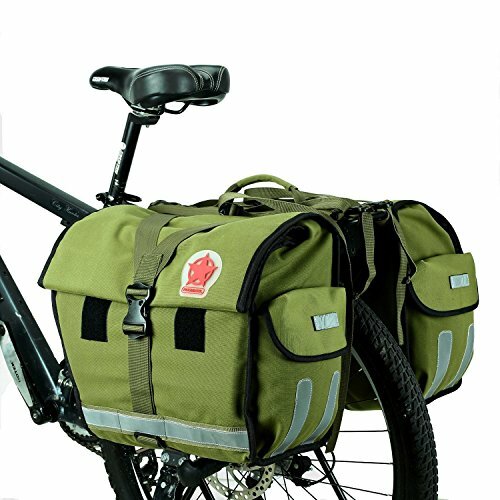 Your beautiful bike deserves a matching bike bag. 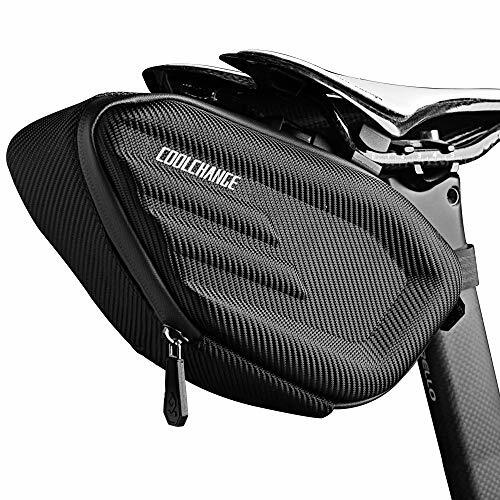 Large capacity : Patented Angel Wing shape offers the bicycle saddle bag the maximizes space utilization. Wallets, phones, keys can be easily put into the bicycle bag and still have a spare room for repair equipment, snacks, and more. 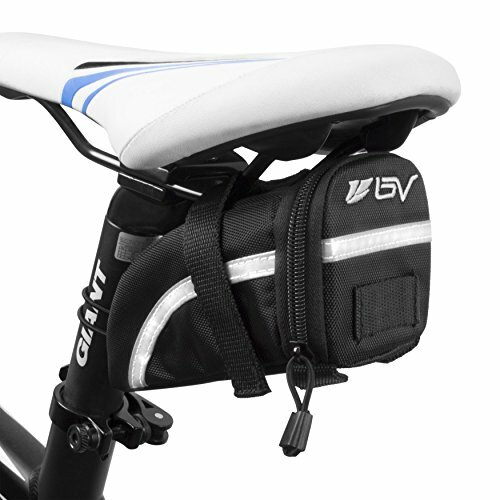 the bike seat bag's side opening design allows you to quickly find items. 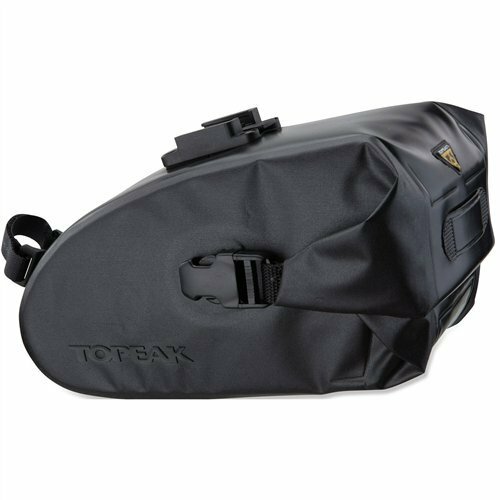 Fully waterproof : The bike underseat bag's seam-sealed zipper and the waterproof shell help to eliminate the water totally and keep your valuables dry all the time. Clip install : The quick release clip of the cycling saddle bag not only provides better stability but also ensure the bike bag can be removed immediately, saving the time of uninstalling the bike bag and allow you to take the cycling storage bag with you anywhere. Warranty & Support : Worry-free 180-DAYS WARRANTY. 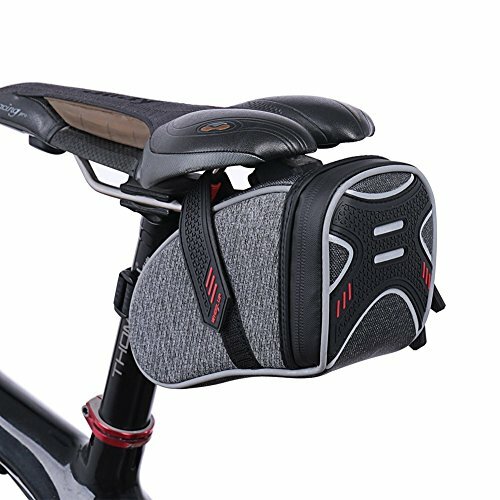 If the bike seat bag has any issue, please click the contact seller button to contact us, we will give you a satisfactory solution. Made of 210 Denier ripstop nylon and polyurethane-coated air mesh. 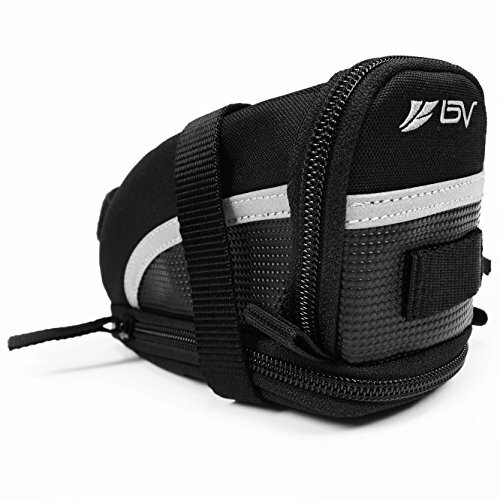 This BV saddle bag allows riders to bring along small personal items while biking! Stores items such as multi-tool kit, tire patch kits, tire levers, keys, snacks, listening device (iPods, etc. ), smaller cameras, and more! The patented designed zippered opening is made for easy access with a light clip on the outside (taillight - not included),and a mesh pocket inside for holding smaller items more securely (like a key).The elastic band wraps around seat post for more secure mount. Attachment: Velcro Fastening (for Under Seat) with an Elastic Band (for Seat Post). Reflective Strip: Yes - 3M. Light Clip (Taillight): Yes. Size(L, W, H): 6.12" x 2.2-2.76"x 2.16-3.31" Capacity: 16.1-30.98 oz (477-916 ml). Weight: 3.2 oz (90.7 g). Solid and light weighted. For all the small personal items. This saddle bag is part of the quanshin that includes four different sizes: large, medium and small. These four different sized versions with a big zippered mouth allows riders to bring along your necessary items while biking! stores items such as keys, a phone, snacks, listening devices (ipods, etc. ), Smaller cameras, a wallet and more! (depending on the size chosen - extra small size will fit smaller items only.) The big zippered opening is design for easy access with a light clip on the outside (taillight), a mesh pocket inside and an elastic strap inside for holding smaller items more securely. Space structure with smooth lines, reducing drag, stylish appearance and sturdy. Items in the bag will hardly drop out. Saddle dedicated buckle and Velcro strap, keep the bag sturdy so will not come loose nor swing side to side. As every cycling lover may know, there is a phenomenon that professional cycling products are rather expensive while common products are not professional enough and may give rise to physical injury. WHEEL UP is born to break this situation. Since established, WHEEL UP has been insisting on providing professional, comfortable and cost effective products for global cycling lovers; Getting more people love cycling, enjoy the fun of cycling, thus promote the progress of cycling culture. Roll closure keeps water and mud out and contents dry. Mounts and removes quickly with our innovative QuickClick System. We focus on outdoor items. The best quality is our culture. Double silicone velcro strap can easily hold onto the bike saddle base, while the front velcro can be convolved and fixed on the front frame to keep the bag stable, both velcro closure can be adjusted to fit most types of bikes. 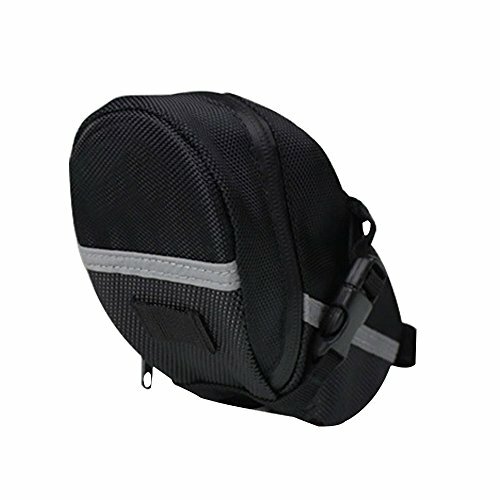 The compact sized bike saddle bag is compatible with most small cycling tools like bicycle light, cycling gloves, towel, flashlight, cash, cards, USB cable, bicycle repair tools, etc. Take all you need without effort. 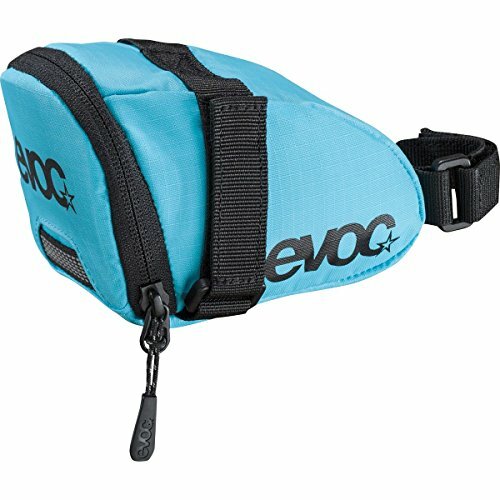 Fully water resistant and durable material make this bag stand the severe weather, the compact size and roomy space allow it a must-have for cyclists. 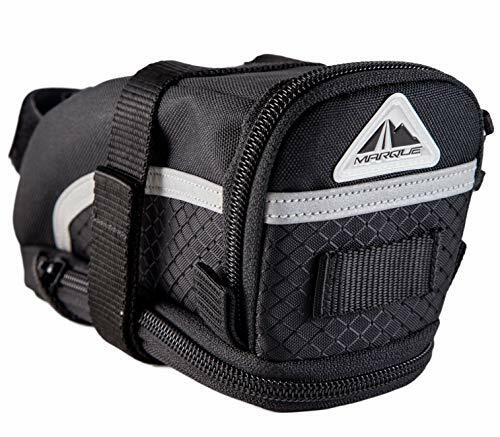 Enough to Hold Your Small Essential Items; Reflective Straps on the Bicycle Saddle Bag and Compatible With Taillight to Ensure Your Safety. design pull heads, easier for you to mount and remove. 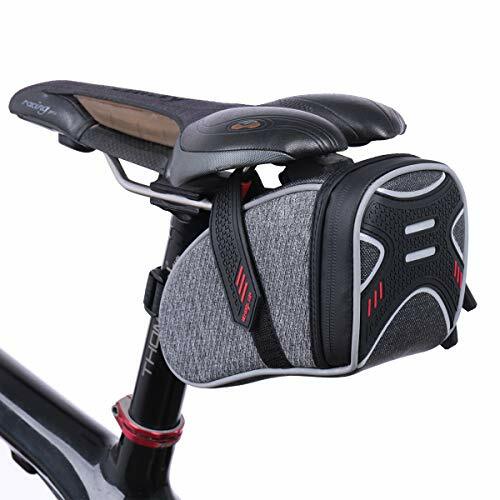 PLENTY OF ROOM: Bicycle saddle bag with 1.6L large capacity main pocket, you don't need to carry a bulky backpack or fill up Jersey pockets anymore, specially in long rides. It has enough room for long ride essentials like energy bars, repair tube, patch kit, chain lube, tire levers, mini pump, keys etc. INNER COMPARTMETNS DESIGN: two MESH POUCHS + one CLOTH POUCH + one elastic FIXING STRAP. It is convenient for you to separate CO2 cartridges, keys or some things which need to. The pump can be fixed by elastic straps, and the design of the thickened sponge on both sides can protect your phone and gears well. SEAT POST HEIGHT ATTENTION: Our bike bag under seat is suitable for most bicycles whose seatpost height is greater than 25cm like small E-bikes, Unicycles, Electric Scooters, Water bikes,road bikes, mountain bikes, Folding Bikes and more. Please measure your seatpost height before purchase. TWO TAILLIGHT LOOPS: Reflective on bottle holder pocket and two available taillight loops, extremely increase your riding safety at night. 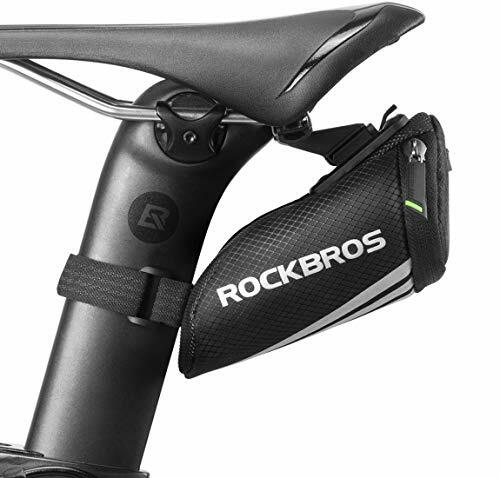 WATERPROOF: ROCKBROS Bicycle seat bag is made of carbon microfiber (easy to clean after riding on a muddy road) and Waterproof zipper to keep your items dry in the rain. You've meticulously selected every component on your bike for optimal performance and appearance. Why settle for just any saddle bag? The Orucase Saddle Bag with ski strap attachment system uses a durable single strap that holds tight so the bag will not shake around on bumpy trails or when sprinting, never wears out like velcro does, and will never chafe or rub shorts. Three sizes allow you to carry as little or as much as you need for your discipline and style of riding. Capacities (tools and accessories not included): SB20 - 20 cubic inches - one road tube, multitool, tire levers, CO2 and valve, plus extra. SB25 - 25 cubic inches - one gravel tube, multitool, tire levers, CO2 and valve, plus extra; or two road tubes, multitool, tire lever, patch kit, plus extra. SB30 - 30 cubic inches - two gravel tube or one mountain tube, multitool, tire levers, CO2 and valve, plus extra. 2. If there is obstruction on your seat rail, you will not be able to install this bike under seat bag. 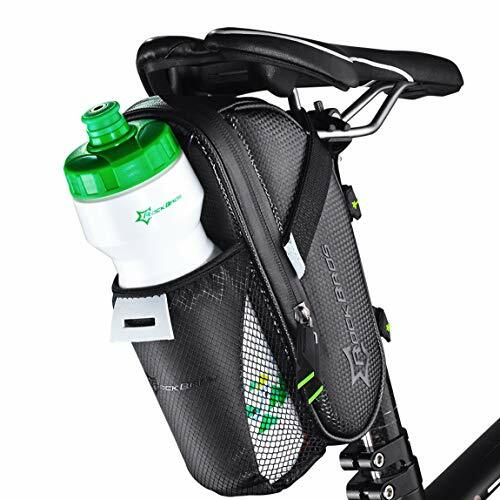 INWALK cycling bag are constructed of tough EVA with 3D die-casting process. The bike saddle bag will look stiff at any time. Your beautiful bike deserves a matching bike bag. 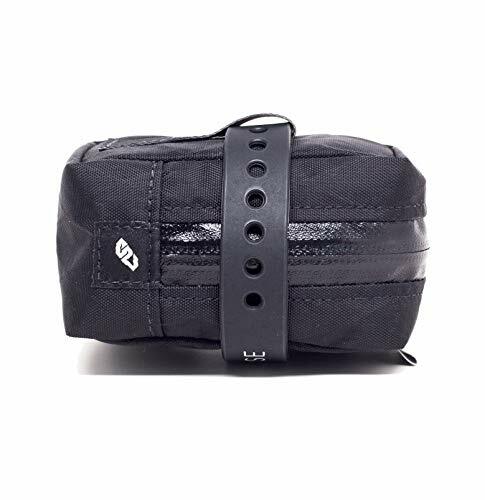 The bike under seat bag's seam-sealed zipper and the waterproof shell help to eliminate the water and keep your valuables dry .Should not be in heavy rain for a long time,forbidden bubble water. Wallets, phones, keys can be easily put into the bicycle bag and still have a spare room for repair equipment, snacks, and more. Enough capacity for your require. 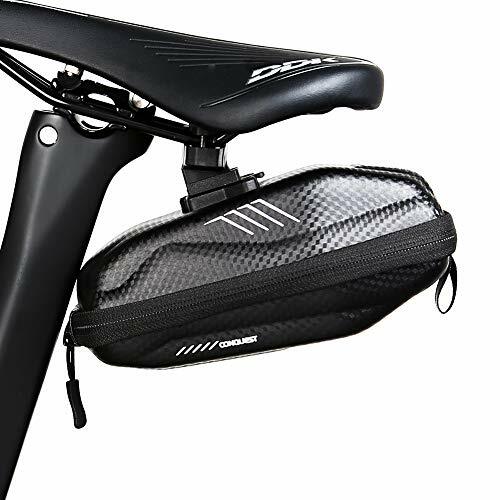 The quick release clip of the cycling saddle bag not only provides better stability but also ensure the bike bag can be removed immediately, saving the time of uninstalling the bike bag and allow you to take the cycling storage bag with you anywhere.